Jéremy Jouve had his musical training in France, studying with distinguished guitarists including Eric Franceries, Alberto Ponce, and Roland Dyens. He is a graduate of the Ecole Normale de Musique de Paris, and of the Paris Conservatoire National Superieur de Musique et de Danse in guitar and chamber music. He was selected to pursue further studies with Laszlo Hadady, principal oboist of the Ensemble Intercontemporain. Precocious as a musician, at the age of ten he played a Vivaldi concerto with the Orchestre de Chambery, going on to win various national prizes. Based in Paris, he embarked on an international career, with awards including first prize in the International Competition of the Guitar Foundation of America (Mexico, 2003) and in the Tychy International Guitar Competition (Poland, 2002). 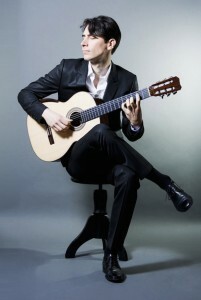 After a concert tour of forty venues in the United States, Canada and Mexico, he appeared at the Tchaikovsky Hall in Moscow, the German Iserlhon Guitar Festival, the Radio France Festival at Montpellier, the Mexican Saltillo Guitar Festival, and at the concert hall of the Luis Angel Arango Library in Bogota, as well as in India, Singapore, Great Britain, Greece, Spain and elsewhere.